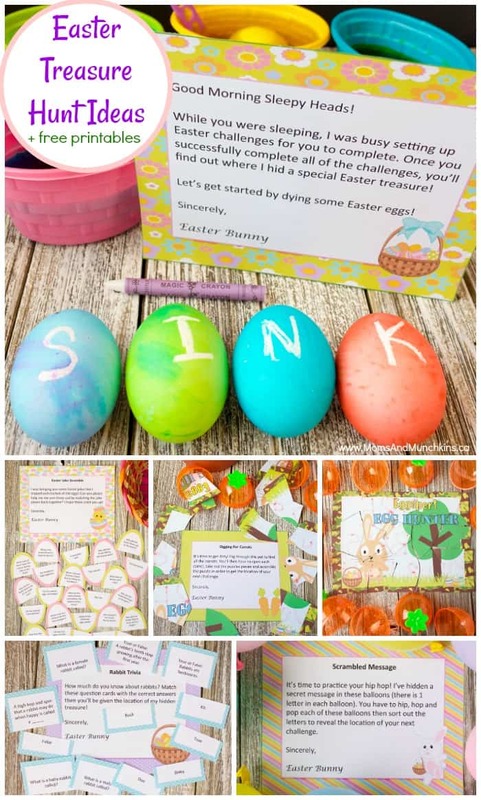 These unique Easter treasure hunt ideas are just as fun for the Easter Bunny to create as they are for the children to solve. Remember to include a short explanation with each challenge set up for the kids. We’re here to help – free printables are shared below! What fun Easter hunt activities do you remember from your childhood? Did the Easter Bunny have any fun traditions that you hope he continues with your children? For this first challenge, you’ll want to hard boil eggs & leave them to cool. 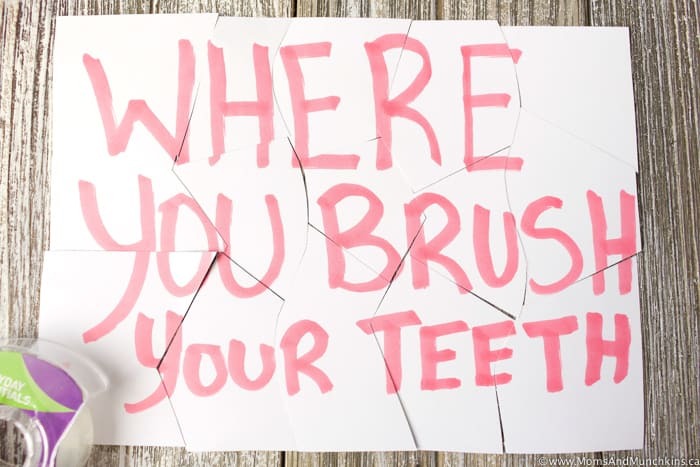 While you’re waiting, think of an area in the house that you’d like to hide the next clue. Once the eggs are cool, use a white crayon to write one letter of the word on each egg. For instance, if you wanted to hide the next clue in the S-I-N-K then you’d use 4 eggs. Leave the kids bowls, water, dye and the secret eggs. As they dye the eggs and they start to dry, they’ll discover that each of the eggs has a letter on it. They’ll need to figure out that these letters need to be put into the correct order so they know the location of their next clue. We’ve created a freebie of Easter riddles/jokes and answers. 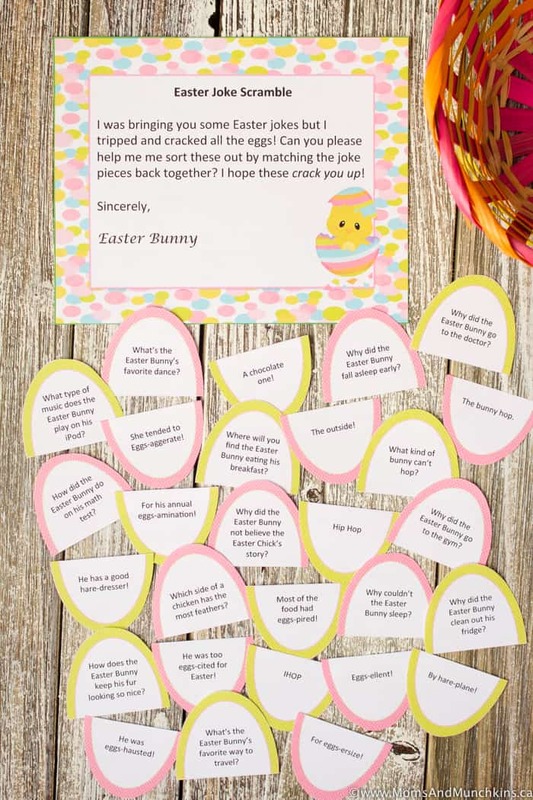 You’ll want to start by printing these Easter jokes, cutting out the eggs, then cutting through the middle of each egg so that the questions are separate from the answers. Bury all these paper eggs in an Easter basket filled with paper grass. The kids will have to dig out all of the eggs and then match the Easter riddle egg top with the correct answer egg bottom in order to be awarded their next clue. What’s the Easter Bunny’s favorite dance? Answer: The bunny hop! How did the Easter Bunny do on his math test? Answer: Eggs-ellent! How does the Easter Bunny keep his fur looking so nice? Answer: He has a good hare-dresser! Why couldn’t the Easter Bunny sleep? Answer: He was too eggs-ited for Easter! Why did the Easter Bunny clean out his fridge? Answer: Most of the food had eggs-pired! Which side of a chicken has the most feathers? Answer: The outside! What’s the Easter Bunny’s favorite way to travel? Answer: By hare-plane! Why did the Easter Bunny fall asleep early? Answer: He was eggs-hausted! Why did the Easter Bunny go to the gym? Answer: For eggs-ersize! Why did the Easter Bunny go to the doctor? Answer: For his annual eggs-amination! Why did the Easter Bunny not believe the Easter Chick’s story? Answer: She tended to eggs-aggerate! For this clue challenge you’ll need construction paper, a marker and balloons. Cut out small squares of paper in different colors so you can use one color per word. Write a word scramble puzzle for the kids to solve. As an example, “Front Hall Closet” with the letters F-R-O-N-T on blue paper, H-A-L-L on green paper and C-L-O-S-E-T on white paper. Put these small pieces of paper inside of balloons and inflate the balloons. 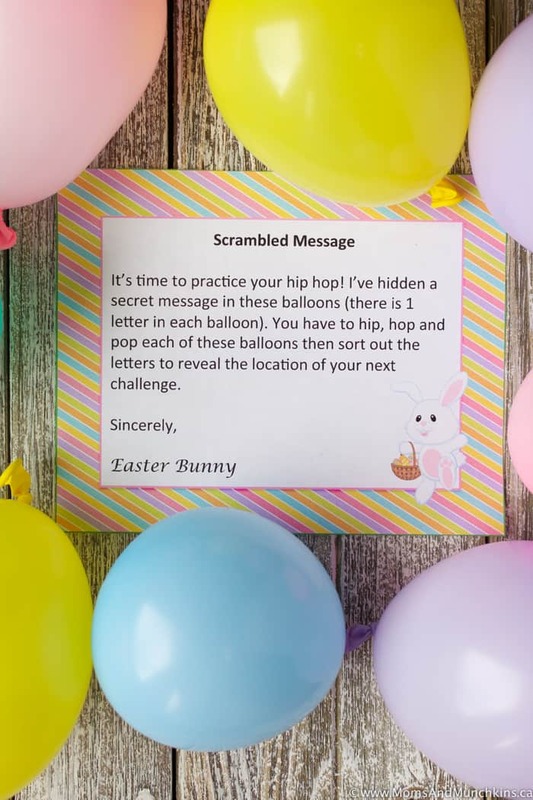 The kids will have to pop all of the balloons in order to gather all of the letter squares they’ll need to find their next clue. 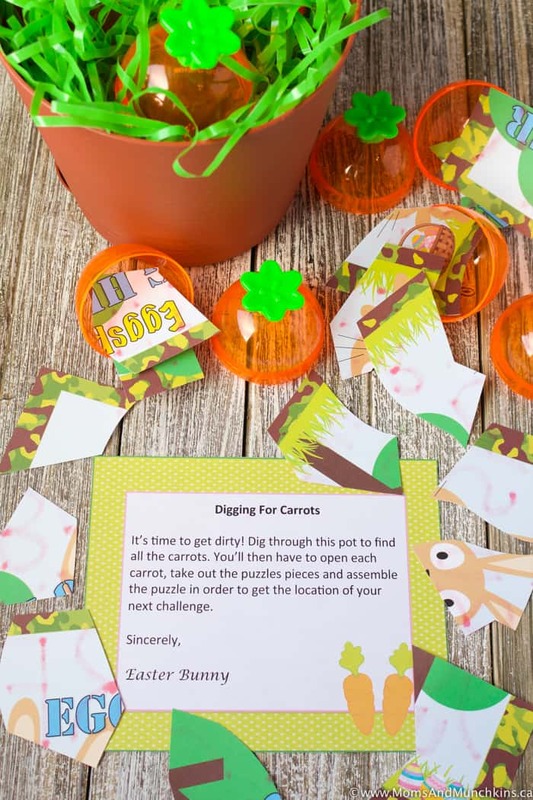 For this clue challenge you’ll need plastic carrot Easter eggs, a flower pot, a puzzle and “dirt” (chocolate cookie crumbs work well or plastic grass for less of a mess). Put pieces of the puzzle in each of the plastic carrots and then bury them in the pot. The kids will have to dig out the carrots in order to get all of the puzzle pieces. Once the puzzle is correctly assembled, the kids can be given their next clue. For this game, I wrote the clue on the back of the puzzle so when the kids finished assembling the puzzle and taping the pieces together, they’d find out the location of their next clue/challenge. 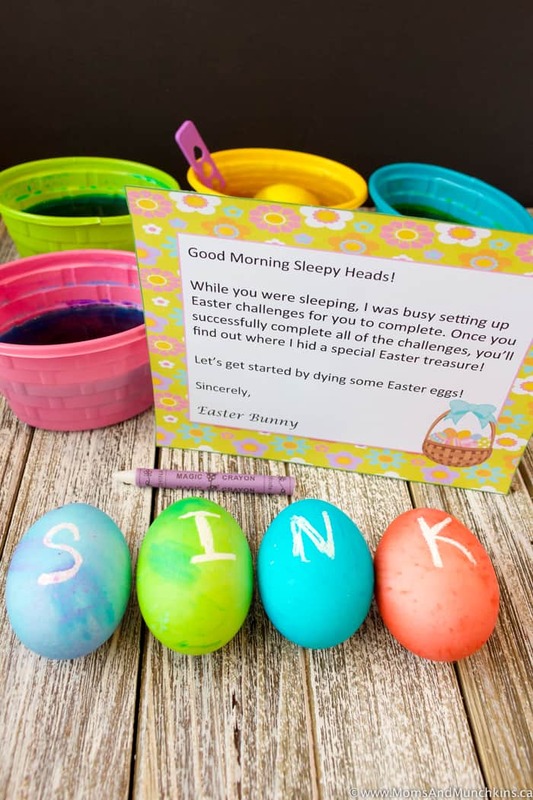 For this clue challenge you’ll need plastic eggs, pipe cleaners in all colors, pom poms in all colors and sizes, glue, google eyes and an Easter basket with paper grass. Place googly eyes, pipe cleaners and pom poms in the plastic eggs. 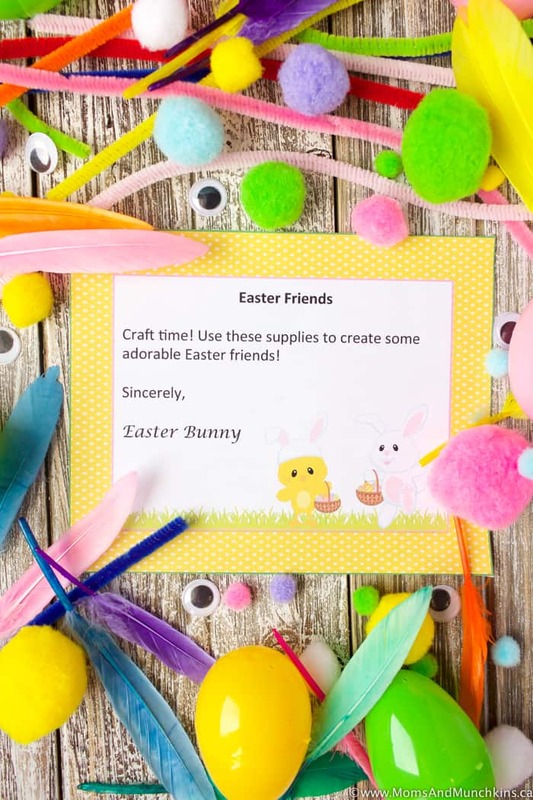 The kids will have to open all of the eggs (can bury the non-toxic glue bottle in the basket as well) and then use these supplies to create Easter friends such as baby chicks, bunnies, etc. Once the majority of the craft supplies are used up, the kids can be given their next clue. Hide a toy rabbit in the next clue location and put an envelope of “Rabbit Trivia” the it’s hand. 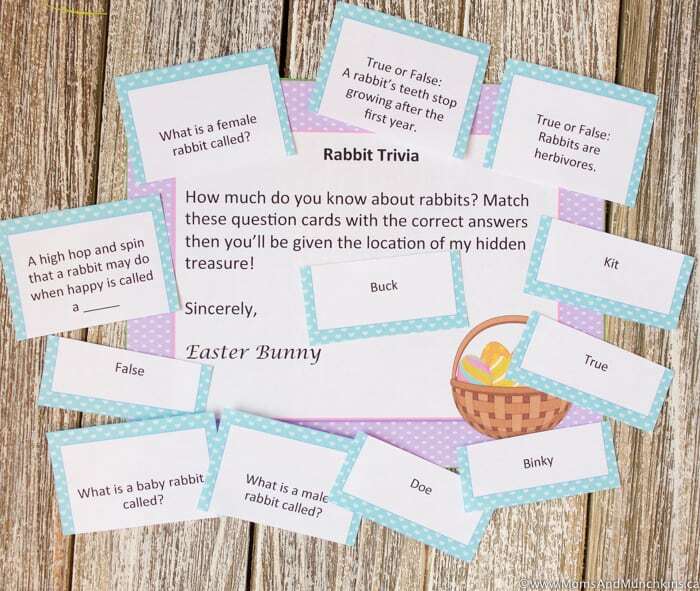 The kids will have to correctly answer the trivia questions (free printable matching game) in order to receive the final clue to the location of their Easter basket treasure! Which is your favorite Easter treasure hunt game? We have all the clue/instruction cards here for you to print out as well. Happy Egg Hunting! 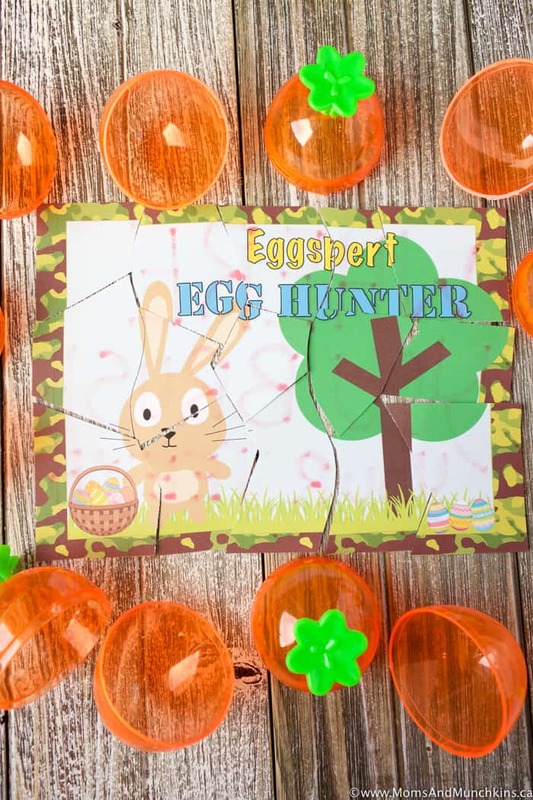 For more Easter fun, visit our Easter page for loads of free printable games, activity ideas, party ideas and more! Stay updated on all the latest ideas for family fun by following us on Facebook, Twitter, Pinterest and Instagram. Digital Clipart & Papers provided by Pixel Paper Prints. I’m glad you like them! Thanks for visiting!